If you have basic blackjack strategy down pat but struggle to resist the urge to split any pair you land in your hand then you’ve come to the right place. Splitting pairs may seem like a good idea, or even the only idea, but it isn’t always advised according to the basic blackjack strategy which is determined by statistics. There are times when you should always split, times when you should never split, and times when you need to evaluate the dealer’s hand in conjunction with yours. What is the basic blackjack strategy? The basic blackjack strategy is a chart created for a specific blackjack title — there are variations such as separate charts for when the dealer stands or hits on a soft 17, as well as different versions of blackjack such as Atlantic City Blackjack. These have been created through the use of statistics and determined with computer precision. 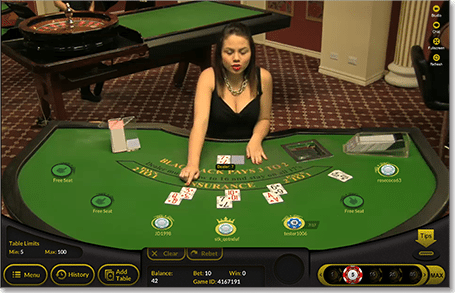 It shows what action is best in the given situation and compares the dealer’s up card with the player’s hand as well as with the odds of what the best outcome achievable is. The dealer’s up card is located on the vertical axis while the total value of the player’s initial hand is located down the horizontal axis. By following the chart you aren’t guaranteeing that you will certainly win but by using certain actions it does improve your odds and prevents any silly mistakes. Always split a pair of eights and a pair of Aces, no matter what. Two eights is considered the worst hand in blackjack as it amounts to 16 and sees the players chance of busting at 62%. Eights cannot bust so splitting these two is the smarter move. Aces should also always be split as having two hands starting with 11 is smarter than having one hand of 12 as you can’t bust on a hand valued at 11 but you can on 12. It also gives you a higher chance of getting blackjack as you are basically starting off again with two hands featuring an Ace. Another golden rule for basic strategy is never split a pair of fives or a pair of 10s. A pair of fives amounts to a total of 10 and you aren’t likely to get two hands higher than 15, which is a very weak hand, if you split the fives. Regardless of the dealer’s hand, it is advised to never ever split a pair of fives. As for a pair of 10s and picture cards the total amount of the two is 20 which is an extremely strong hand with good odds in terms of beating the dealer, so the basic strategy recommends to always stand and never split on a pair of 10s or picture cards. A pair of fours is also recommended as pairs which you shouldn’t split, however there is an exception. Never split if the dealer has anything but a five or six as you will end up with an uncomfortable weak hand similar to splitting with fives. If they do have five or six they have a high chance of busting, as these are known as bust cards, which means you can split and still win even if you end up with a weak hand. The rest of the pairs isn’t as definitive in terms of the basic strategy and ultimately depends on the dealer’s hand. Should I split pair of nines? Players should only split nines if the dealer doesn’t have a seven, any picture card or a 10, or an Ace. If the dealer is showing one of these cards, 18 is a strong enough hand for a player to go against the dealer and your odds are quite good that the dealer isn’t holding more than 18. What about a pair of sevens? Splitting sevens is tricky. Holding a pair of sevens amounts to 14 which has a 56% chance of busting if you hit on it. However creating a hand out of two sevens is difficult so it is best to only split if the dealer has an eight or higher, and hit if they have a seven or lower. This is because the dealer’s bust out rate is still lower than a players odds of busting with 14 when they have a card amounting from a two to a seven. When should I split a pair of sixes? A hand totalling 12 only sees a player with a 31% chance of busting so its generally best to hit. However. if the dealer has an up card of four to six, it may be worthwhile splitting. What about a pair of twos or threes? Splitting a pair of two or threes is possible but only recommended if the dealer’s up card is showing a four, five, or six with the dealer having a good chance of busting in this situation. With a total hand of four or six for the player there isn’t any chance of busting with the hand, however if the dealer doesn’t show the bust cards it is generally recommended to hit. Sign up to play blackjack for real money at G’day Casino and claim an unlimited matched deposit upon registration.